And that's a wrap from us here. Thanks for your company as ever on an engaging day at the foot of the Premier League table. See you tomorrow for more of the same. Wayne Rooney went through a bizarre 10-minute solo warm-up at half-time, he appeared to be testing an injury, and he's now coming off. On comes Radamel Falcao. Juan Mata's penalty gives Manchester United a half-time lead. Newcastle manager John Carver: "When you suffer that sucker blow of conceding the first goal, it is hard. It was like land of the giants against West Brom, with the back four who are all centre-backs. "But I think we showed courage and the fans got right behind the team and roared us on. It was like the old St James' Park. "I think that all the players showed the fight to show what the team and the club means to them. Sometimes you need to stir the hornets' nest to get us going and maybe some of the things that have happened this week have done that. "Our destiny is in our own hands and the dressing room is about a million times better than it was after Leicester. We need to show a little more finishing ability, but we have Papiss Cisse back for us after he gave us 20 minutes or so today." More from John Carver on BBC Radio 5 live: "It's probably been the toughest week of my life. "There's been an awful lot said but one thing I would say is when you see a performance like that - and hopefully it's not too late - is that the players do care and they do want to stay in the Premier League." best coach in the world comment, he added: "When I go to the golf course and stand on that tee box I think I am the best golfer in the world. "When I play cricket I think I am the best all-rounder in the world. "The remark I made was tongue-in-cheek. That's the way I am." Luke Shaw has had an injury-hit season at Manchester United and he's got another one here. He went up for a header and must have had a bad landing, he was holding his neck. He leaves the field on a stretcher and Jonny Evans comes on. Hull boss Steve Bruce on centre-half Michael Dawson being off the pitch when Burnley scored: "I'm not making any excuses but that rule is totally and utterly ludicrous. It is ridiculous that your centre-half has to go off because of a bit of blood on his nose. It was hardly gushing out. "It's nonsense. It might not have affected the result but it didn't help. You expect Michael Dawson to be standing there and heading the ball clear. It summed up the afternoon for us." On survival: "No one gave us a cat in hell's chance at Palace or Liverpool, but we believe we can get a result at Tottenham next week. We have got to play better - but we can't play any worse than today." David Moyes continues to frustrate Barcelona! It's goalless at the break. Follow the second half here. Hull manager Steve Bruce on his team slipping into the bottom three: "It's a huge disappointment - it has been an awful weekend. The disappointing thing for me is that we needed a big performance and we didn't play. For large parts the game bypassed us. "That's the disappointing thing after playing so well against Crystal Palace and Liverpool a week ago. We played nowhere near to the standard required to win a Premier League game. "Burnley have beaten us twice and if you want to stay in this division you have got to beat the likes of Burnley. Whether the occasion got to them, I'm not sure. Now we have got a mountain to climb." "It was like being in a football stadium again." Newcastle manager John Carver on BBC Radio 5 live: "We went 1-0 down from another set-piece but showed some character. We didn't show that last week at Leicester and it was good to see. "The brilliant thing for me was that it was like being in a football stadium again. Everybody was so focused on the football, including me. "I thought the fans were fantastic, and that's not me playing lip service, that's from the heart." Who do you think has scored the most penalties in Premier League history? It's Liverpool with 102, ahead of Chelsea on 100, Arsenal on 94, Manchester United on 90 now and Newcastle on 89. Aston Villa manager Tim Sherwood: "I'm not interested in other results. It's in our hands. If we get the results, we'll stay up. "The results haven't always gone our way, but the performances have been gradually improving. Today wasn't pretty, but we deserved the win, no doubt about that. "I watched Tom Cleverley score a lot of goals for Watford many years ago, but you've got to get into the box to score goals - and he's done that. "I want two wins now. We're going all out for that." Juan Mata steps up, left footed, passed into the corner. Tidily done. Ashley Young's cross hits Scott Dann on the arm and the penalty is given! It was high up, near his chest, that looks harsh to me. Leicester City winger Marc Albrighton: "This run is breeding confidence in us. There is a sense we are almost there but we need to keep doing what we are doing. I'd be surprised if the club has been through so many big games in such a short space of time but we have two massive ones now. "We were dead and buried eight weeks ago and everyone pointed that out so if we can pull this escape off it will go down as one of the greatest." West Brom manager Tony Pulis: "The lads have got 40 points before we have come here today. We knew that Newcastle would be up for it today, but we have responsibility to the clubs around the bottom who are fighting for their lives. "We are just sorry that we have had two clear-cut chances that have come back off the post. I'm delighted for all the Albion supporters and everyone who has backed me since I have come in here that we are staying up. "We will try and change one or two things around on and off the pitch in the summer, but we want to keep the same sprit that has held us in good stead. "It is very difficult to say what a team is going to do in the next game, they showed great fighting spirit today, but if you look at results around the bottom of the table it is a credit to all those managers down there how they have responded to the challenge." Worth a go...! Daley Blind lines up a 25-yarder and hits a swerving strike, right across the ground, and Julian Speroni just about gets a hand on to it and pushes it against the post. Brilliant save! Stoke City manager Mark Hughes: "We got the reward for a really good performance, we were excellent from start to finish and saw the game out quite comfortably. "In recent weeks we have conceded the opening goal but today we got our noses in front and I felt we were really comfortable. It was a performance of a top 10 side. The quality of our play at times was exceptional." Nico Lennon: Big point for us (Newcastle) today. Vital to stop rot. Burnley did huge favour winning at Hull. On to QPR next week with Janmaat back. Jonathan Grieve: That was a really nervous 90 minutes. 3 points would have been nice but I can't complain. Much more optimistic for #nufc now. Leicester City manager Nigel Pearson talks to Match of the Day's Gary Lineker: "It transpires that we needed the run we have had to give ourselves a chance. When you get to Christmas with the position we were in we were hoping we'd get to the final day with it still being in our hands. We have had a fantastic run but have work to do. Even for a weird manager like myself we have to take stick and see it through. Is Pearson sport's most prominent Nigel these days?Image caption: Is Pearson sport's most prominent Nigel these days? "The players continue to work hard, believe in ourselves. Throughout the season we played to a level where the results didn't always reflect our performances. The fans stuck with us, they've seen enough to suggest we've got performances in us. This run's been phenomenal really. Look at Sunderland's win today at Everton, it shows you can't really compare seasons. With 37 points we are still having to fight hard." Finian in Peterborough: Plenty of the Burnley players such as Danny Ings, George Boyd etc are of Premier Lague quality, so expect a lot of players to leave this summer. Callum in London: Burnley are in good hands to come straight back with Sean Dyche at the helm. Let's hope they see sense and stick with him. The sides are out at a sunny Selhurst Park. Palace are safe from the drop, while a win for Manchester United would see them close in on Arsenal in third. Southampton manager Ronald Koeman talks to BBC Sport: "If you start the game and you know the opponent is fighting against relegation you can expect they are aggressive and we weren't in the beginning. It's difficult to explain. "At least we had a reaction. We didn't create any good chances. It's difficult to explain because we play for European football. If you watch the first goal it tells everything. Between three or four players from Southampton, their player is scoring a goal. "Everybody is hungry for European football because it's a great achievement and still we are in that situation, we have to react and change our mentality. "Always the last part of the season gives someone a good or bad feeling. We need a reaction next week at home because the fans expect and deserve a team that will win next week." "Aston Villa are playing well. They had their backs to the wall in the second half and when you're near the bottom of the table, in front but under pressure it is a true test." You'd think that that Burnley side can be right at the top end of the Championship next season if there are no major changes. The Norwich side in the play-offs is basically the one which went down. Obviously they will lose Danny Ings - where is he going to end up now? Burnley manager Sean Dyche after his side's relegation was confirmed despite beating Hull: "I'm delighted with the way the players performed today and the manner of the result. Statistically we knew it would be tough to stay up, but mentally the players have been terrific. To say they have been written off from the start by so many - their resilience has been fantastic. We did what we had to do today but we have not done it enough over the course of the season. "Scoring goals has been our problem. Our shape has been good, our energy and work-rate has been terrific. The players will grow from these experiences - so will I, so will the staff, so will the club. I've been proud of the players home and away, we have always tried to attack and played on the front foot. But of course relegation is disappointing. "Today's performance has been a step forward for Burnley, and typified what they have brought to the Premier League. They battle hard but are just short on quality - but they will come back stronger. For Hull City - oh dear. Worrying times for them." This photo doesn't do him justice. A beast.Image caption: This photo doesn't do him justice. A beast. One of the stars of the season for me, the Crystal Palace eagle, goes through his pre-match routine of landing on the crossbar and just being generaly terrifying. Absolutely massive. Map out the road to Premier League and cup glory by predicting the scores for all the remaining games in the Premier League and FA Cup and see how your guesses fare against BBC pundit Mark Lawrenson. Gavin Harper: Stoke don't get the plaudits they deserve. Matched last season's total with 2 games left, and with our best player (Bojan) out! Chris Minshull: Why are Spurs being slated and Stoke given no credit for being the dominant team for 90 mins for the 2nd time this season? Is Big Sam right about West Ham's lack of firepower? Can he survive this summer or is he off? "Hull's points tally that they have got is not enough, they need more points so they are now the favourites to go down in that third position." West Ham manager Sam Allardyce: "Our cutting edge has been missing for many weeks. We don't have anybody who can score a goal. It doesn't matter how many chances we create, we're not scoring. We'll struggle to win a game between now and the end of the season if we can't score a goal. "We felt we should have had a penalty when Leandro Bacuna put two arms on Enner Valencia. Lee Mason didn't see that, but he saw something by Kevin Nolan on Shay Given. "We're not sure about the offside decision against Enner Valencia in the second half. The assistant is in a terrible position to give that decision. The only reason he's given that is because the two Villa players nearby are in front of Valencia, but there are three defenders elsewhere who we think are playing him on." Across the channel there's another big game in the Spanish title race as David Moyes locks horns with Lionel Messi. in our European live page. Stay in this page for all of the fallout from Burnley's relegation, John Carver and Newcastle and the rest of the 15:00 BST games. "I can see Newcastle staying up only because Hull have two difficult matches against Tottenham and Manchester United. Newcastle showed a bit of fight and I think they will stay up." Manchester United manager Louis van Gaal reveals that several members of the squad, and staff, are struggling with a virus. His throat is very crackly, he is one of the victims. Stuart from Harrogate: That was a must-win for Hull even before all the other teams around them picked up points. Looks like they're going to let Newcastle off the hook. Rob Overfield: Hull City deserve to go down on that pathetic performance. What an inept 90 minutes. Rob in Warrington: Has a team in 19th ever been relegated before a team in 20th before? "Burnley have only had four home wins. You need seven or eight to have a chance. But the way the club has been run has been good. "They have not over-spent and they have stabilised the club. They have fought, but lacked the real quality at the top end. "It looks like they have a long-term strategy and hopefully they don't fall down the leagues." Burnley matchwinner Danny Ings: "The lads showed unbelievable fight and spirit today. I thought we were phenomenal and were on top from start to finish - but it has come a little too late. The lads have fought until the end - and I'm extremely proud of them. Now we are going to play the last two games with pride and hope to finish strongly." In the late game Crystal Palace make three changes from their defeat at Chelsea. Pape Souare, Miles Jedinak and Glenn Murray come in for Adrian Mariappa, Jordon Mutch and Jason Puncheon. Manchester United make two changes from the side who lost to West Brom last time out. Luke Shaw and Phil Jones come in for Paddy McNair and Robin van Persie. This surely means Wayne Rooney being pushed back into attack. Robin van Persie misses out for United due to a virus, while Angel Di Maria was injured in training on Wednesday. Newcastle captain Fabricio Coloccini: "We have to look forward now and try not make sure that we don't put ourselves at risk next season. This result leaves it in our hands we have to win and then we will be safe." Nick Harris: Sad to see Burnley go down, played more spirited football than Sunderland, QPR, Hull. That win against City will be historic. Anthony Shaw: Burnley are getting relegated - as a Rovers fan this is music to my ears. Credit to Leicester though, wrote them off months ago. Eamonn McGurk: Burnley are down! Didn't lack effort but Just didn't have enough quality to stay up. So Burnley will play in the Championship next season and QPR will join them if they lose to Manchester City on Sunday. After that it's one team from five, with Hull, Newcastle, Sunderland, Leicester and Aston Villa all in the mix. Rob Frost: At least Clarets have tried their best with a great attitude and amazing spirit. The question is who will have the best chance of coming back, financially sound Burnley or QPR with their massive fine? Luke, East London: Only two more games of Sam Allardyce. The football has been painful since Christmas, last year at Upton Park we need a manager with energy and new ideas. Manager Sean Dyche and captain Jason Shackell lead the Burnley players over to the away fans, they get a huge reception. After more than 10 hours without a goal those away fans have at least seen both a goal and a win this afternoon. In the end they just weren't good enough. 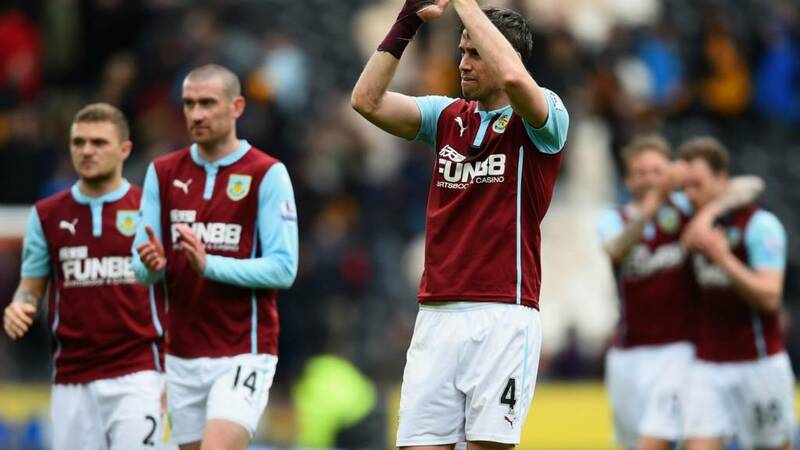 A win at Hull was not enough to save Burnley, who go down. Tom Cleverley's goal is enough. Villa continue on the winning trail. Top drawer from the Potters. Samuel Ameobi, behave yourself! Outrageous effort, a full on overhead kick from 18 yards which flies just over the top! Gordon: Undoubtedly better as a team under Pochettino instead of Sherwood or AVB? Not at all. A team that loses twice to Stoke, loses at home to Newcastle, WBA, Leicester, gives little or no effort at the end of the season and has Paulinho, Lamela and Chiriches anywhere near the first XI isn't that good to me. I've seen some ropey Spurs sides since I've been following them - since 1958 incidentally. Gabby Agbonlahor gets in behind... can he seal it for Villa? No... Aaron Cresswell does well to get back and put the striker off and the ball goes wide. Joe, Nottingham: Jamie Vardy has exactly the kind of passion and determination to spur a whole team and its supporters on. Roy Hodgson is in the stands today - take note. That's not the spirit, James! FOUR MINUTES added on at Hull. Hull desperately need a goal. "There will be a few thousand Newcastle fans knee-deep in chewed fingernails the way things are going here. Last few minutes and while they may yet end that run of eight successive defeats this game is now so stretched we could yet get a winner from either side." James Haworth: As a Blackburn fan, I can tell you I'm just about to get the party poppers out and put the banners up. Burnley are going down, and we're having a party. Another goal for Stoke caps an impressive performance and result. Marko Arnautovic pulls the ball back across goal for Mame Diouf to slide a low shot under Hugo Lloris. Game, set and match. West Brom push forward and Tim Krul has to make another save from Saido Berahino. As it stands a point will be enough for Newcastle to stay out of the relegation zone. After eight defeats on the spin is a point good enough? Mark J, Writtle: Cheer up Hull fans - you've got Spurs next week. Guaranteed three points as the Spurs back four will no doubt be flicking through travel brochures during the game. Still Aston Villa fail to put the result beyond doubt, this time Ashley Westwood dragging a low shot wide. click here to follow action from the KC Stadium. West Brom sub James Morrison lunges in ugly and late on Ryan Taylor, it's an out of control tackle and he's lucky to only see yellow to be honest. Wale Ibraheem: The influence of Cambiasso on this Leicester team is enormous. He deserves a huge credit if they do manage to stay up. James: If relegation dogfights were decided by grit and determination, Burnley would be safe and Newcastle would be bottom. Stoke are playing some sumptuous stuff now - one-touch football in and around the box ending in Ryan Shawcross's low ball into the box and Jon Walters should score when his tame shot finds the keeper from six yards out. INTO THE LAST 10 MINUTES - as it stands Burnley are relegated. Aston Villa have bossed this game, but their failure not to put it firmly away has seen West Ham grow in confidence. Big Sam has thrown on Carlton Cole and the heavy artillery is firing long balls in the striker's direction. Leicester close to a third as Esteban Cambiasso drives one into the side-netting and at the other end Sadio Mane has a shot turned over by the athletic Kasper Schmeichel. Jay: Sunderland get two deflected goals. Hull denied by the crossbar twice. Talk about fine margins in the relegation dogfight. Chance! Newcastle are skating on wafer thin ice here, wafer thin. Saido Berahino gets in behind their so-called defence and his left-footed snapshot is well saved by Tim Krul. click here to follow action from St James' Park. Luke Wilson: This is another terrible result. Irrespective of this Spurs are undoubtedly better under Pochettino than AVB or Sherwood. A West Brom win would keep Burnley alive for another week - but only as long as they win. Hull go close to a leveller when Robbie Brady curls his second free-kick of the afternoon against the crossbar. You couldn't get much more unlucky! Two belting strikes, two rattlers off the bar. Good ball into the box from the right by Tom Cleverley but James Collins nicks the ball off the toe of Christian Benteke. Villa should have been out of sight by now. click here to follow action from Villa Park. So close! Chris Brunt scrambles a shot against the post after his original header was well saved! West Brom inches away from a big goal! Signs of a belated Southampton stirring but Leicester remain well in charge. They are content to let the Saints see plenty of the ball and have gone to a back five. "The sight of striker Papiss Cisse coming on was greeted with thunderous noise from Newcastle's fans. He has been their main goal threat this season - and how they need one right now. The good news for the Toon Army is that Newcastle have kept West Brom very much at arm's length in this second half." Jack Grealish is running rings round Alex Song and a third foul in not very many minutes results in a yellow card for the Hammers midfielder. Burnley have the ball in the net but those sort of challenges have not been allowed since the days of Nat Lofthouse! Ashley Barnes bundles it in but he takes plenty of the keeper with him. A nice spell of possession for Spurs, but it all feels too little too late as Stoke soak it all up and look to break in numbers when the visitors lose possession. Papiss Cisse is on for Newcastle. How they have missed the Senegalese goalhanger during his seven-match ban for spitting with Jonny Evans. Can he find a vital goal in the final 20 minutes or so? Hull are in dire need of a goal and Abel Hernandez digs out a clever backheel but Tom Heaton does well to adjust his feet and make the save. Sorry Burnley fans, you are still down as things stand. If Leicester City win against Southampton and Newcastle United avoid defeat by West Bromwich Albion, while Aston Villa do not lose to West Ham, it doesn't matter what the Clarets do. They will be relegated. All are happening so far. A let-off for Aston Villa as Enner Valencia buries a header but is correctly flagged for offside. But only just. Danny Ings's goal was his first in 1,036 minutes in the Premier League. The days of being photoshopped sipping wine with David Moyes in Sociedad seem a while ago eh? Former England striker James Beattie on BBC Final Score: "That's 10 goals this season for Danny Ings. The Burnley fans would have been hoping it would be nearer 15 or 17, but double figures is still a decent season." Christian Eriksen swings his trusty right peg but the ball is tipped over by Jack Butland. Goal! It may well be in vain but Burnley have scored for the first time in over 10 hours! Without the injured Michael Dawson [see 16:18] Hull make a pig's ear out of clearing a corner and Danny Ings swivels to crash home left footed. "There is an air of genuine desperation among these Newcastle fans. They are responding to manager John Carver's plea to back the team but there is a very obvious, constant anxiety that West Brom could produce something on the counter. Hull defender Michael Dawson takes one in the face and is not happy as the referee takes no action. He is then made even less happy when the ref spots blood on his face and makes him go off for treatment. Can Burnley capitalise? Charlie Adam is running the show now. With Spurs down to 10 men, he gets the ball in midfield and beats all comers until bending a shot which is tipped wide by Hugo Lloris. If Leicester looked any more comfortable they's be in dressing gowns and pouring the drinks. Southampton have been very poor today. "I think James Morrison coming on will make West Brom play. I just wonder how long they will leave Brown Ideye on the bench because he will be perfect today." Jack Grealish is warmly applauded by the home supporters as he picks up the ball with four men around him and somehow creates room to spread play out wide. Class act. What a frustrating side Newcastle are to watch - must be doubly so for their fans. On two or three occasions they construct the basics of a good move and get within sight of the West Brom goal but each time the selection of final pass is terrible and West Brom are happy to hook it out. It's like the Charles NZogbia of 2008 as the winger jinks inside the West Ham defence but fires into the side-netting. If Tim Sherwood can get him playing well, Villa have got a gem on their hands. Paul, Telford: Pochettino recently said Spurs need a big summer. A big summer sale. Sell at ANY price - Lamela, Soldado, Kaboul, Paulinho, Fazio, Adebayor, Chiriches. These guys bring NOTHING to our team. That's brilliant from Danny Ings, driving run from the left wing right across the penalty area. He is about to pull the trigger but goes down as Paul McShane makes a challenge. Was there much contact? He appeared to also run into his team-mate Ashley Barnes. The ball runs on to Scott Arfield and his shot is blocked. Excellent period from the Clarets though. Mame Diouf gets round the back of Vlad Chiriches and the Spurs defender drags him to the floor. Free-kick, a second yellow for Chiriches and that steep hill they've got to climb becomes a mountain. "To suggest Chelsea have been boring this season is absolutely nonsense. Diego Costa has given them a different dimension going forward and he has freed up the likes of Cesc Fabregas and Eden Hazard. To suggest Chelsea have been boring is disrespectful." Use the play icon at the top of the page to watch Final Score (UK only). A Newcastle defeat would change the scene at the bottom once more and Craig Gardner is mighty close to putting West Brom back ahead. He ghosts in at the far post to meet a clip from the left but scuffs his shot into the side-netting. West Ham's Nene has a pop from range and the ball goes over the bar. Close but no cigar. A reminder that if you want to concentrate solely on your team, BBC Sport now offers a separate live page on each Premier League game. Close! Great effort from Ashley Barnes who hooks on an overhead kick and the bounce carries the ball wide of the far post. Burnley going down fighting. Kick-off delayed at Stoke because of an uninvited pitch invader. He is swiftly dealt with and we can get this game back on. Just getting up and running again around the country. What more twists and turns await us? Bad news for Burnley fans - more bad news that is. As it stands, even a win today would not be enough to avoid relegation for another week. Results are not going your way. Lawrie, Cambuslang: Typical of Sunderland's season. Two wins on the trot and the way things are going we'll still be in the bottom three with Arsenal and Chelsea away to come. We're doomed I tell you. Paul Cate: Villa have gone from having one of the worst managers in the league to one of the best. A big half-time team talk for Steve Bruce then at the KC. A goal, any goal will do. If the Tigers win today they will be out of the bottom three. Former Newcastle left-back Olivier Bernard told Sportsworld on BBC World Service: "You need your main players to take the lead and there's no leader at Newcastle. "That's the problem, that's what we've seen in recent weeks. We've got two or three names but I don't think they're natural leaders." Norwich City striker Cameron Jerome on Twitter: Not a bad result overall away from home always going to be a cagey game. Lads stood up strong roll on next week. The second leg of the Championship play-off semi-final is at Carrow Road next Saturday. Still playing at Leicester after a lengthy early injury stoppage. The Foxes have had an amazing run of late and it looks like continuing. Ryan Mason takes a pop but it goes wide. And there is the half-time whistle. One thing's for sure, nobody from Hull to Leicester will be able to relax much over the next fortnight. The Tim Sherwood-inspired Villa revival continues. Nearly a second for Villa as Jack Grealish plays a clever ball down the middle for Christian Benteke but Carl Jenkinson does well to stay strong and outpace the Belgian. Ian, Lancaster: Spurs have given up on this season. They're not interested in Europa League and half the team look like they know they're for the chop. Take Eriksen, Kane and Lloris out and we look like an average Championship squad. Reiss, Glasgow: Why the Saints sent out a perfectly good goalkeeper in Artur Boruc on loan I will never know. No cover for the vital Fraser Forster. That Newcastle goal has put Hull back in the bottom three. Meanwhile Burnley - who will be relegated soon enough - have now gone over 10 goals without a top-flight goal. A dismal record. Marko Arnautovic is really gunning for the goal bonus today. He takes a third pop at goal and again it's on target but Hugo Lloris does just enough. Do Newcastle possess a player with any quality I asked? Yes. Ayoze Perez with a massive goal, taking a cross down with one touch on the edge of the box and snaking a crisp left-footed strike through a defender's legs and right into the bottom corner. Huge! That lifts the Magpies out of the relegation zone. This sums up Spurs' problems today - Harry Kane has not touched the ball once in the Stoke penalty box. "Newcastle manager John Carver puffs out his cheeks and turns away as Victor Anichebe puts West Brom ahead and the Toon Army are in the Premier League's bottom three - for now. Jareth, Manchester: Sunderland last week, Leicester today. Can only assume Southampton have identified Moussa Sissoko as a replacement for Schneiderlin and think they'll get him at a cut price if Newcastle go down. Newcastle playing with no real plan, just hoping for a moment of individual quality to break down a stubborn West Brom. Have they got any individuals gifted enough for that? I'm not so sure. Moussa Sissoko is trying to make things happen but he sees a low shot easily saved by Boaz Myhill. So close! Hull within the width of a ball from glory as Robbie Brady lifts a delicate free-kick over the wall from a good 25 yards out, beautifully flighted, Tom Heaton beaten but the ball smacks against the crossbar. Morgan Amalfitano is lucky to avoid even a telling-off from the referee for an off-the-ball kick out at Tom Cleverly. Not much in it, but you can't do such things. Leicester are flying and they nearly make it three, Jamie Vardy with the pace to get in behind but his effort was well saved. click here to follow action from the King Power. Grim reading for the Toon Army. No points in eight games spells trouble. Hull are being given a massive favour by West Brom, as that goal lifts Hull out of the drop zone for now. Burnley are threatening at the minute though, they look the better side. Former England striker James Beattie on BBC Final Score: "You have seen it with Christian Benteke and now you are seeing it with Tom Cleverley. Tim Sherwood has given the players confidence and told them they are good players. "If you give the players freedom to express themselves on the pitch this is what you get. Tim has gone in there and done a fantastic man-management job. A few weeks ago Aston Villa were clearly in a false position." Mark, Berkshire: Truly abject from the gutless Saints. The failure to provide adequate coverage for Fraser Forster has not helped either. And that's the sign of a team in a terrible rut. Almost score at one end, concede instantly at the other. It's a really good header from Victor Anichebe though, holding off his marker to flash home Craig Gardner's cross. I like Hugo Lloris. I like him a lot. But let's be honest... he makes a right mess of coming to collect this long punt forward and Steven Nzonzi is in the right place to guide the ball home from 12 yards out. Newcastle finally do threaten as Moussa Sissoko has a shot blocked on the line by Joleon Lescott! A great chance. Could he have done more there? Only eight yards out. Let's give Lescott the credit. No goals in 37, now three in three for Tom Cleverley, who taps home after Jack Grealish got behind the West Ham defence and laid the ball on a plate. Tim Sherwood - managerial genius. Burnley almost break their goal drought! Ashley Barnes wrestles with his marker and flicks a header on goal but he can't keep it down. Newcastle have had 67% of the possession but apart from a few long-range efforts they've created little. How the locals must long for Papiss Cisse, Demba Ba and Yohan Cabaye. It's like an old bottle of pop this game - just no fizz in it as Leandro Bacuna pumps in a cross from deep which is aimed at nobody in particular and finds nobody in particular. Finally some life from Spurs as Erik Lamela floats in a free-kick which Eric Muniesa heads against his own bar. "It's very, very flat. Once Newcastle beat one red shirt there's another along very quickly. It's a Tony Pulis team. They are well drilled." Steve Bruce is on his feet but he can't celebrate a goal yet. Ahmed Elmohamady meets a left-wing cross with a powerful header but he can't steer it on target. Meanwhile, it's almost 10 hours now since Burnley found the net. As it stands they will be relegated this afternoon. Stoke's goal was manufactured down the right. A deliberate ploy? This heat map suggests so. "Southampton have not started well. You have to go into games, even if you have nothing to play for, and you have to have an intensity and go in to the game playing at some pace. But Southampton have not shown that and are 2-0 behind." A goal for Hull would leave Newcastle in the bottom three so it's only right that Ryan Taylor should have a go from 40 yards out. He cracks in a free-kick with plenty of swerve and power, but the shot drifts wide. It's been coming - Stoke take a deserved lead when a poor defensive header lets in Mame Diouf down the right and the striker's cross is deflected into the path of Charlie Adam who stoops to head home from six yards out. Marko Arnautovic cuts inside and has a pop but Hugo Lloris beats clear.